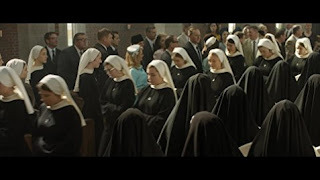 Screenplay writer and movie director Margaret Betts has given us the 2017 release, the Novitiate, a story line which covers 10 years from the 50's into the 60's and in an era where the Roman Catholic Church was under going great changes via Vatican II. It stars Melissa Leo as the overbearing and abusive Reverend Mother or "Mother" of The Order of the Sisters of the Blessed Rose, where several young girls have come to train for a while in order to become members of the Novitiate where the wheat is separated from the chaff, in the world of producing nuns for the order. Once accepted, the women will never leave the convent and will lead a life of prayer and military like discipline. It was beautifully filmed in Nashville, Tennessee and world premiered at Sundance, early in 2017. Julianne Nicholson plays main character Novice Sister Cathleen's (Margaret Qualley) mother, Nora Harris, a divorced single mother. She did not raise her young daughter to be religious but Cathleen did get an opportunity to attend a Catholic school and it was there she felt the call, much to her mother's dismay. The story told in the film presents a wide variety of questions and viewpoints but not many definitive answers which is a good decision when involving a film about organized religion. Don't expect very many real answers to the storyline questions but do expect to think long and hard about what is right and proper in the indoctrination rituals of organized religions, especially when military like hazing rituals come to mind. And secrets. Of primary prominence is Melissa's Leo's amazing and oft times frightening performance as the women responsible for all that happens, good and bad, with in the pristine stone walls of the gorgeous convent grounds. Everything is perfect looking in and on but we soon find out that things are definitely not as they seem. While those inside seek peace and to commune with God on a daily basis, there are conflicts around every sharp, hard and bleak corner. These young girls are mostly 17 and 18 and while they seem to know what the seek and want, to marry God and serve him, every day, through devotion and prayer, their young minds and bodies send them messages in conflict. All of them struggle with the imperfections and shortcomings that Reverend Mother continually points out to them. they doubt them selves and their decision, which flies in the face of the reasons they are there in the first place. Nothing is to come before God; friendships, distractions, shortcomings, outer trappings, the outer world, and even family are not allowed to come in real contact with them. It is as if Mother is trying her best to form them to be as old, unattractive and bitter inside as she is herself, as she battles authority within her own church and the edicts of Vatican II, which she is resisting with all of her might. The girls lose each other along the journey an they must feign friendships, budding sexual feelings, separation from friends and reality as well as the realization that convent life is not all that it is cracked up to be in their romantic young heads. The emotional abuses are palpable as well as the physical abuses are visceral. Catherine in her quest grows gaunt and unwell as if she is truly giving her heart, body and soul to God. They are punished for speaking at the wrong times, emotionally humiliated as they examine any faults, taught how to inflict self pain to promote inner suffering and bring them closer to the One they love. It all comes across as a sick, sadistic ritual rite of passage and not all of them make it. The film is about the girls and their journey, and the dedication it takes to make such a life long commitment. Dianna Agron portrays the trainer who empathizes with the women, as her own journey was completed in the last three years, and see the benefits of the changes that Vatican II will bring the changing church. The film is frequently difficult to watch, and cradle Catholics will not much like what they see, or accept that it might have once been a reality. But the film's value lies in its examination of the young women and their journey as well as the very fine acting performances found in all of the cast. People will talk about this one.